ANNAPOLIS, MD (CelebrityAccess MediaWire) — Bass player Joe Byrd has decided to retire after 50 years of performing and his farewell concert at Loews Annapolis Powerhouse was standing room only. Byrd, 75, has had a long career, playing for more than 40 years with his brother, guitarist Charlie Byrd. 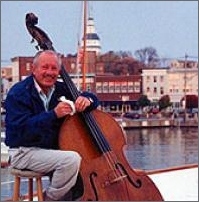 After Charlie passed in 1999, Joe continued to perform, holding regular concerts at Annapolis venues such as 49 West Cafe and Loews Powerhouse with support from his wife Elana, who, in addition to being a lawyer, served as Joe's agent, promoter and emcee. According to the Baltimore Sun, Byrd's decision to step down was, in part, because "at age 75 he was tired of hauling the bass and amps and stool around" Elana told the Sun.